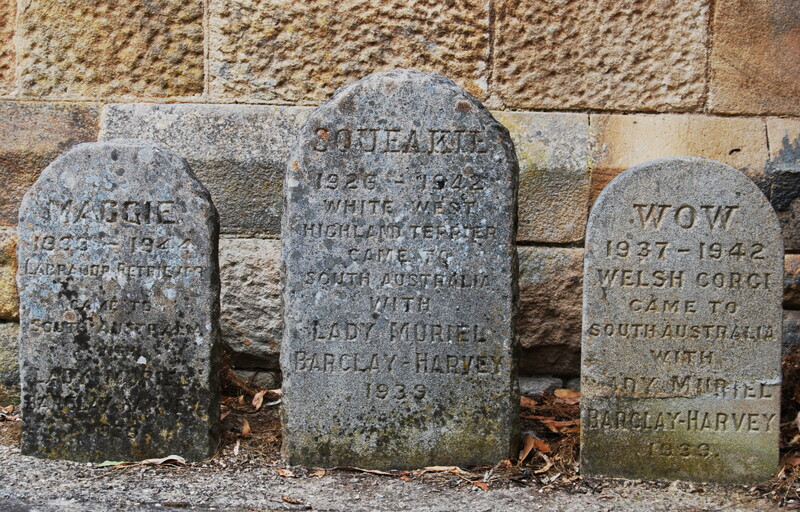 Picture by Perpitus: Pet’s gravestones at Marble Hill Ruins – former South Australian Governer’s summer residence. Wander through the grounds of any of the great old houses of England, and it is not uncommon to stumble upon the gravestone of a beloved animal. We honour them because they loved us and we loved them; they were their own people, and when they leave it creates a gaping space where they aren’t any more. Here in England, a nation of animal lovers, we mark where they lie. And thus, when Winkle the stray cat from Dowlish Wake, near Ilminster in Devon, died, those who knew him buried him in a local garden, and cast about for a stone to mark where he lay. 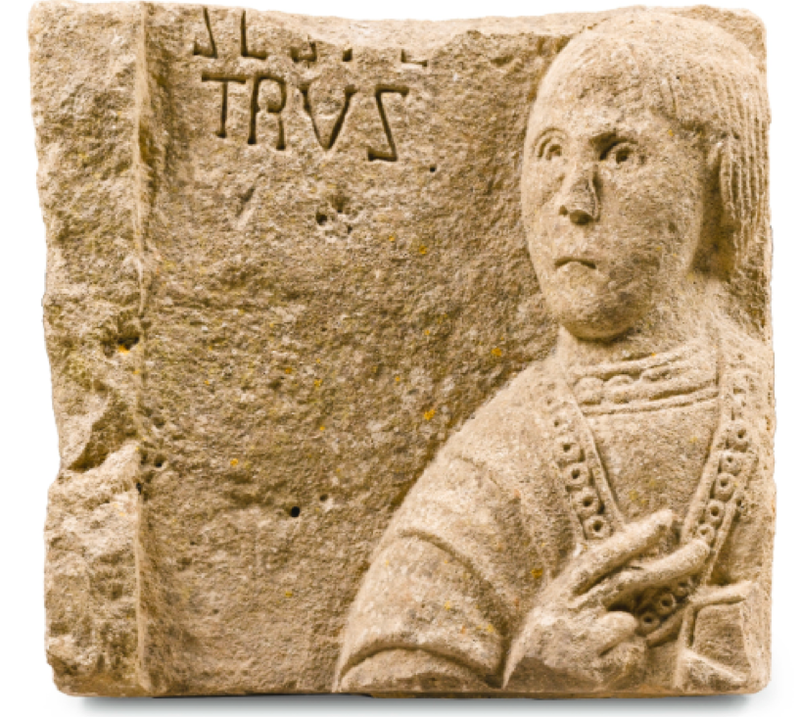 And they found the very thing: a perfect piece of Oolithic limestone, with the most fabulous carving: a figure surrounded by decoration and some writing in Latin. I suppose the writing should have given it away. For many years the stone marked Winkle’s resting place, until Chris Brewchorne, a potter with a studio just over the road, spotted the stone and encouraged Winkle’s people to get it examined. The stone went to be examined by specialist in such finds, Professor Dominic Tweddle, who declared it to be an unparalleled example of English Anglo Saxon carving, dating to the ninth century. It depicts St Peter and is engraved [S]CS [PE]TRUS, and is thought to be part of something much larger. It was auctioned off at Sotheby’s in 2014 – read the fabulous catalogue notes here – and Somerset Heritage Centre has gained funding, assisted by ArtFund, to buy it so we can all go and take a good long look. I shall go and see it, of course; and as I gaze at this stunning frieze I shall send up a fluttering, butterfly-light prayer for the stray cat whose place of resting it marked. Posted in Quirks of HistoryTagged anglo saxon, archaeology, cemetery, Dowlish Wake, gravestone, history, pets, Professor Tweddle, Somerset Heritage Centre. ArtFundBookmark the permalink. Great story. Glad it was recognised and back in the area once more. Seriously, Kate . . . your spell checker must have been snickering at you! This morning our cat wishes he were a stray. He is HOWLING HUNGRY in preparation for a vet visit which will probably result in a tooth extraction. In preparation for probable surgery, we are not feeding him. He is ANNOYED. I feel your pain, Nancy. And indeed, his. Ouch. Thanks, Kate! All of Tigger’s bloodwork looked great . . . except for glucose (still high). So the vet did the cleaning and extracted 4 teeth. Tigger is home and happy with a good appetite. We just have to keep him on wet food for a few days and bring him back to the vet in 2 weeks for a re-check of the gums. So . . . YAY! Brilliant news. Well done Tigger!! *sigh* another way in which the Yanks fall short…I truly feel I was born on the wrong side of the pond…must begin researching pet cemeteries!! Start with Hartsdale – now, is that New York State?- which was founded in 1896 and is on the National Register of Historic Places AND the National Wildlife Register! Now there’s a place I’d love to see. I am deeply perturbed that there is no record of these grave-robbers having ensured that there is a suitable replacement memorial for Winkle! Col, you are right: this is the story within the story…it’s enough to get me jumping into the car and driving down there with a replacement! Aw, you drive a hard bargain…. What an interesting read– thank you for posting! I agree. The spirit of Winkle will bring down a hex on the village and the grave robbers if he is not given a suitable offering. Isn’t there another nice piece of limestone lying about? A pox on all their houses? That’s fair. It’s Devon. Surely there is….and I feel sure they will have replaced the stone; but I shall take steps to find out. Perhaps the potter who discovered the stone in the first place can enlighten us. This is a wonderful story about a national treasure, but I think the real treasures were the people who marked Winkle’s grave. However, like previous commenters, I worry that Winkle’s grave now has no marker. I Googled but found only two more articles, and they said nothing about a replacement. Surely the lady whose garden he was buried in will spend some of her windfall on another stone. I feel sure the stone is replaced already, Kathy: but there is someone I can ask. The man who discovered the stone was a potter who lived opposite. Perhaps he still does. While Winkle’s story is heartwarming, I’m more interested in the stunning carving, so characterful, so clear. We’re so lucky that the details have scarcely weathered, which leaves me intrigued as to the circumstances of its original discovery. So glad it’s been saved by a public body. The man to ask is the potter, Chris Brewchorne, who lived opposite and discovered the stone back in 2004. I know what you mean – it looks so pristine. What was the Latin translation? Hi- It says ‘St Peter’. Thanks for reading! Poor Winkle, deprived of his headstone, but WHAT a headstone. Hopefully someone found another marker for WInkle. The matter is under investigation, Aquila. By myself…. What an awesome face. Love the fingers, too. Perfect commemoration for a pet. Also glad to hear they’ve remarked the grave with something else. What a delightful story. I love the idea of “found art” with such a history; that it commemorates a cat just makes it all the better! After 41 years in our home there are beloved pets buried all over our property. Unfortunately, the popsicle stick crosses haven’t stood the test of time. I wish I’d planned for the future! He looks like he’s saying: put two bob down on Galloping Grocer in the Fifth! And worried his wife will catch him betting. Really neat story, as my boyhood dog is very aged these days I find myself thinking of how I will honor my friend when he finally goes to rest. Glad to know there are others in the world who value the friendship of animals. Glad you’ve all enjoyed this latest chapter in my little discovery. If you’ve any questions I’m happy to answer them. Thank you Chris! Nice of you to get in touch. It’s a wonderful story. It all proved a bit much for Mrs Beeston in 2004. We tried hard to keep her anonymous and I handled the press, but some paparazzi phoned round the whole village to find who the owner was and then blew her cover. She hadn’t expected to be in virtually every newspaper. Eventually we even had a TV crew make a programme about it with an actor playing myself and Mrs Beeston, to go out on Japanese Fuji TV. The stone is actually a small part of a pretty large freize. We did offer it to Taunton at a bargain token price but they declined, saying it was of National importance but there was no evidence it was from Somerset (!). Once the Musuem got hold of it in 2014 at a far bigger price, they came up with their own theories and pretty much brushed us off even though I found it, which is sad, especially as I have a good idea where the rest of it is. I might get out with my spade one day. Await next chapter…… BTW, I also inherited a section of 4th Century BC elaborately carved marble freize which I learnt was from the Agora in Athens. It wasn’t right that it should be here, so I sent it back to them (gratis) and its now in the Acropolis Museum in Athens. I have a letter of ‘eternal gratitude of the Greek people’, signed by the Minister of Culture. What is it with me and lumps of stone?